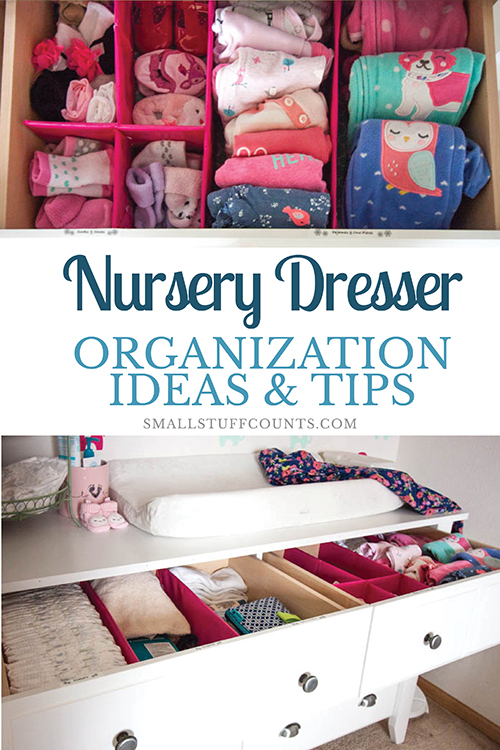 Looking for nursery dresser organization ideas? I’ve got you covered! 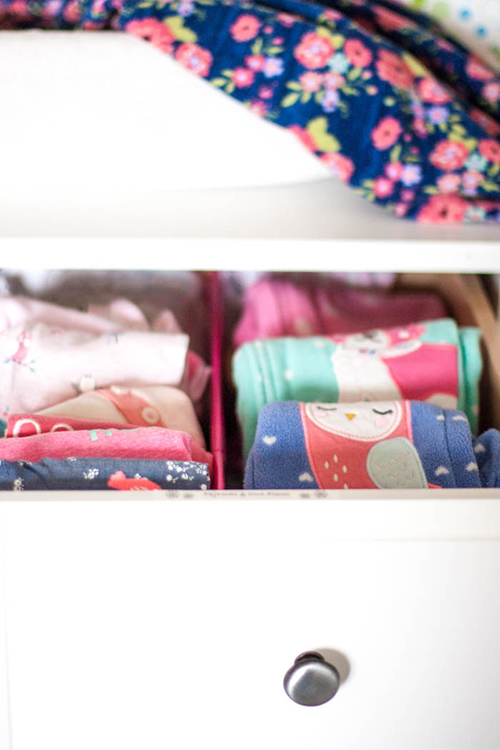 I am soooo excited to share our organized nursery dresser with you today! Now that Chloe is four months old and I’ve had some time to test out a few ideas, I feel like I’ve figured out how to best organize all of those tiny baby clothes so everything is easy to find and easy to access. The photo below shows our dresser set up in the nursery – I’m in love with this little space!! 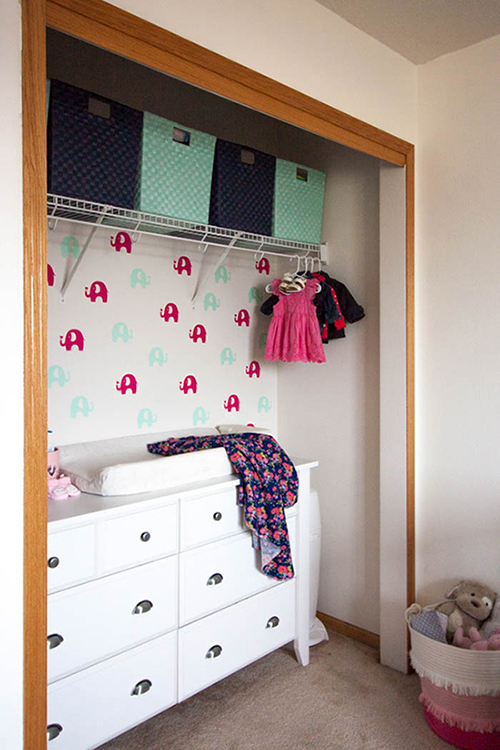 To maximize space, we remove the sliding closet doors and found a six-drawer dresser that fits inside with just enough room to spare for the Diaper Genie next to it. It’s worked out really well to use this dresser as a changing table and its big enough to hold all of Chloe’s itty bitty clothes. I’ll share more details about the closet and the rest of the nursery decor in a post very soon, but for today we’re going to specifically talk about nursery dresser organization ideas. 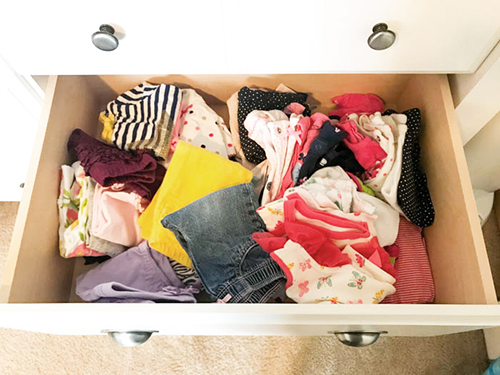 Although the clothes are tiny, babies go through a lot of clothing in a day so it’s important to keep it all organized! 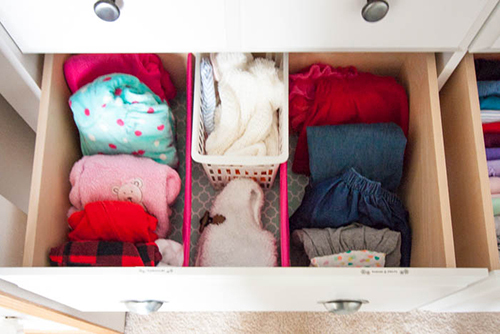 Plus, since they outgrow clothes so fast, it’s extra nice to have organized drawers so you can see everything and make sure they get to wear it all at least once before they get too big. The photo below is a look at how one of the dresser drawers looked like before I started organizing it. My biggest issue was that all of those little clothes don’t stay stacked very well. What were once neat piles of folded clothes quickly turned into a mess that we rummaged through every day. It worked okay since I had all of the same size clothing in this drawer, but I knew it would be worth it to create a better organizational system! When I started organizing this nursery dresser, I first removed all of the contents and sorted everything into piles. I sorted the clothing by size and then by type (bottoms, tops, pjs, etc.). The other supplies were sorted into categories as well. Then I lined the bottom of each drawer with pretty paper and made DIY drawer dividers with cardboard covered in wrapping paper. 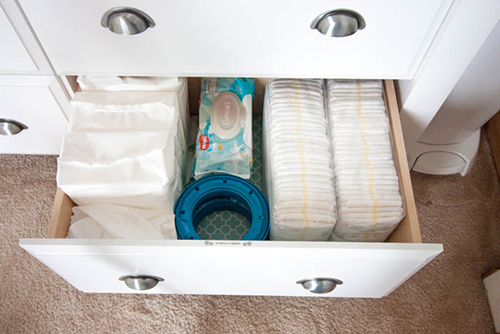 I’ll share specifics of the drawer dividers in a future post, but I basically cut down diaper boxes to fit snugly in the drawers and wrapped the cardboard stripped like a present. It was an easy project that’s made a tremendous difference! Now, let me give you a little tour and close-up look into each of the six drawers of this dresser! The top left drawer is devoted to supplies that we access frequently. We keep the left side stocked with diapers so they can easily be reached with one hand while still holding the baby on the changing pad on top of the dresser. 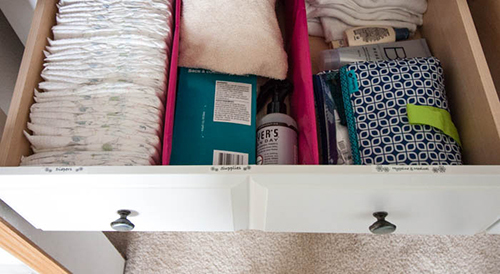 The rest of this drawer holds other essentials like a pouch of medical and grooming supplies. I keep a bottle of scented spray in here so I can freshen up the room when needed. There’s a spare changing pad cover and extra burp rags stashed in the back of this drawer. You always want to have those handy so you’re not digging for them in the middle of the night! 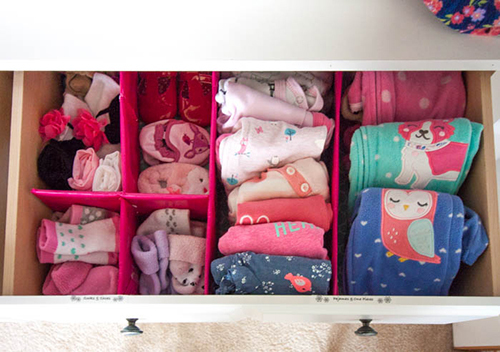 The top right drawer holds all of Chloe’s socks and shoes on the left side and pajamas and one-piece outfits on the right. Doesn’t this drawer look pretty? I put the pajamas in the top drawer so they are super easy to grab at bedtime. 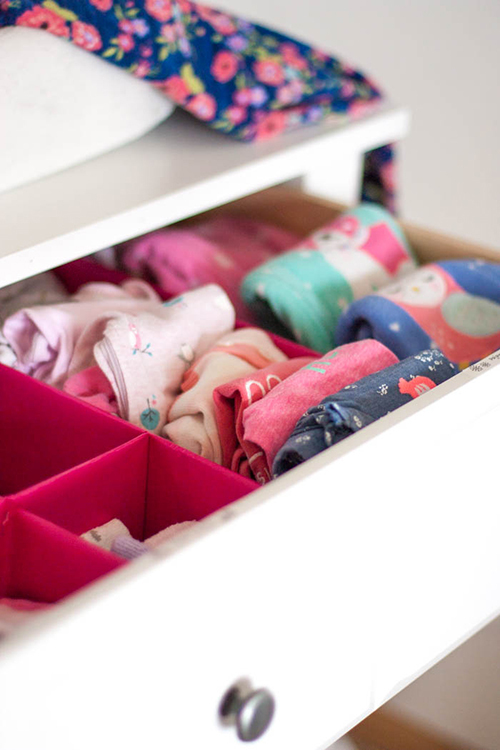 An important aspect of organizing this nursery dresser was folding the clothes into squares that can be “filed.” By filing all of the clothing upright, you can see everything at a glance. The middle drawer on the left side holds seasonal items like hats and sweatshirts along with a few dresses. After organizing everything, I ended up with extra space so this drawer wound up having less in it than the others. That means there’s plenty of room to grow into as Chloe’s wardrobe grows and her clothes get larger. The middle drawer on the right is one we access every morning when we’re getting Chloe dressed for the day. The first row holds her pants, the middle two rows hold bodysuits currently separated into long and short sleeve, and the last row holds shirts and cardigans that pull over her bodysuits. I saved the bottom drawer on the left of this dresser for all of the clothing that’s currently too big. It’s a full drawer! Even though it may not look super organized, I do have the clothes stacked into piles by size. All the size 6-9 month clothes are on the left and the 9-12 month clothes are on the right. If you are short on dresser space, you don’t necessarily need to store too-big clothes in a drawer. They could just as easily be tucked away in a storage bin in the closet or basement. But I love having them here because Chloe is growing so rapidly that it’s nice to be able to grab a bigger size to see if it fits yet. I also purposely placed this drawer on the left side of the dresser so I can have it open at the same time as the top two right drawers that hold most of her clothes. 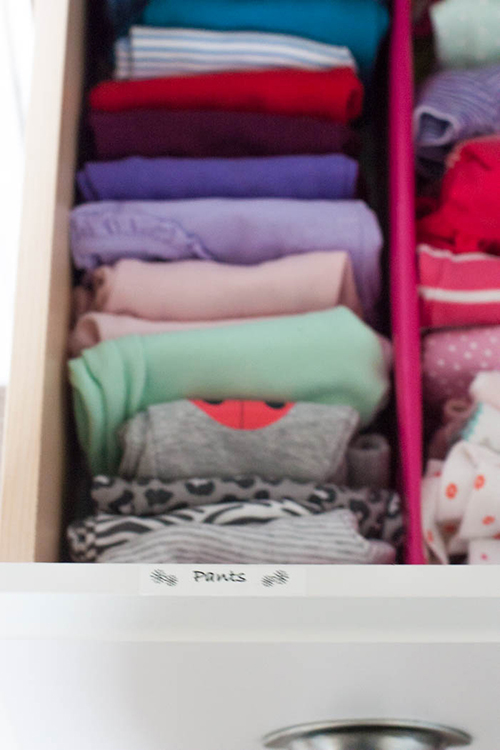 This makes it really easy to transfer clothes into the drawers of things that currently fit. Now, while I’m on this subject of outgrowing clothes, I should note that I also have a place designated for too-small clothes that need to be put in storage. Any time I come across a garment that no longer fits our growing baby, I immediately place it in a storage bin on the shelf of the closet. This gets it out of the dresser so we know everything in it currently fits her. We keep surplus supplies in the bottom drawer. 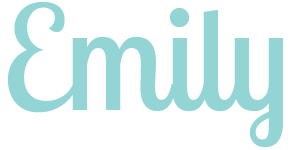 This includes wipe refilles, travel wipes for daycare and the diaper bag, extra sleeves of diapers and refills for the Diaper Genie. We buy all of this in bulk so I have even more stashed in some of the bins on the closet shelf, but we go through it all so fast that it’s really nice to have extras readily available in the dresser. 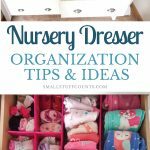 I hope that tour of each drawer gave you some ideas for organizing your nursery dresser! Here are a few of my main tips and takeaways. It’s really important to divide items into categories! 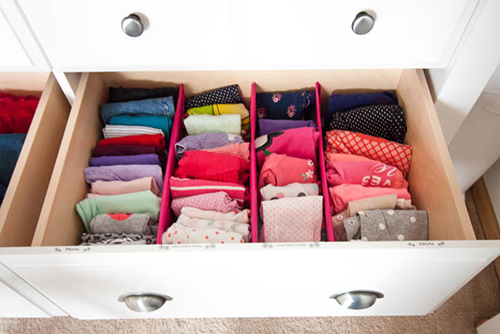 Designate each dresser drawer for a specific category so like items are stored together and can easily be located. This method of folding clothes into squares and filing them front to back makes is super easy to see everything at once. I fold my own clothes like this as well and love that nothing gets forgotton at the bottom of the stack. Line the bottom of each drawer with contact paper or wrapping paper. This makes them look extra pretty and also protects them from any spills or sticky residue. I used a pretty aqua wrapping paper in our nursery dresser. 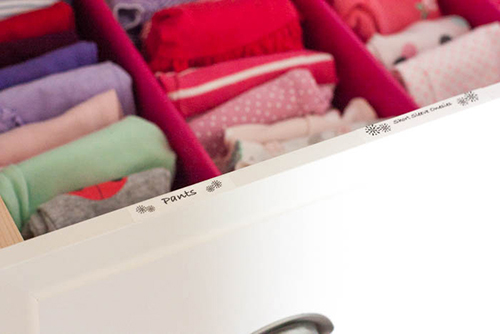 Drawer dividers keep everything orderly and are especially helpful for keeping all of these tiny clothes in place. I made these drawer dividers by cutting diaper boxes into strips the exact depth of my drawer and wrapping them with pink paper from the dollar store. They stand up because they are cut to fit snugly. I’ll share a tutorial on this in a future post, but it’s really simple to do! I got this super handy label maker for Christmas and have found so many uses for it! I can design a label using the app and print it out in a literal minute. Little labels stuck along the top edge of each drawer finish off this organizing project and make it easy to know where everything belongs. Since my husband does the bulk of the laundry around here, I love having these labels because he now understands how I have this dresser organized and can put clothes away accordingly. 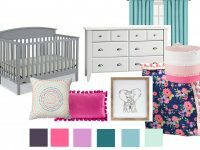 I hope this post gave you some nursery dresser organization ideas! I have to admit, organizing is always fun for me but it was extra fun to be organizing itty bitty clothes. Plus, this was a great excuse to use my label maker and that pretty pink wrapping paper I found at the dollar store! 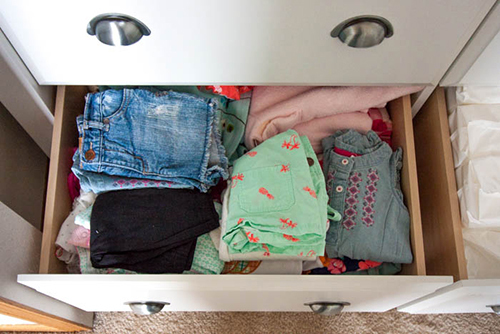 Do you have any other tips for organizing kids clothing? I have a lot to learn as Chloe gets older, but this is what we’ve found works for us at this stage. 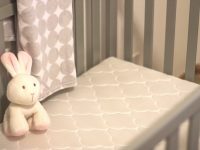 I’ll be back over the next couple weeks to share more nursery updates including a tour of the rest of the closet and changing table. I’m also finishing up some pretty DIY artwork and shelves on the other side of the room that I hope to share with you soon! P.S. Planning a room makeover or big DIY project? 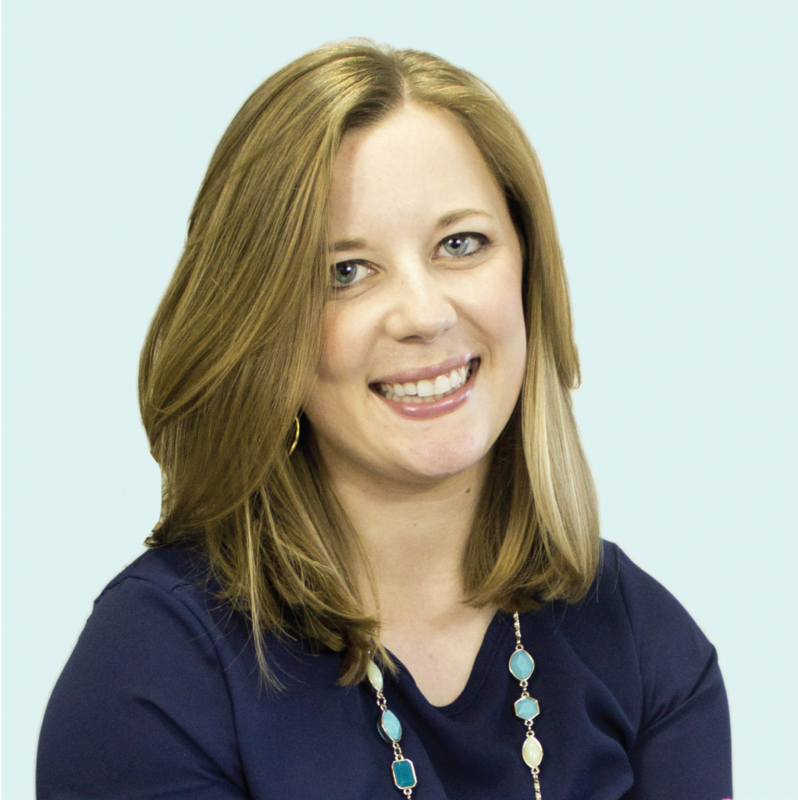 Be sure to download the FREE Home Project Planner to help you plan every piece of your project! Subscribe to the form below and I’ll send the planner to you right away.